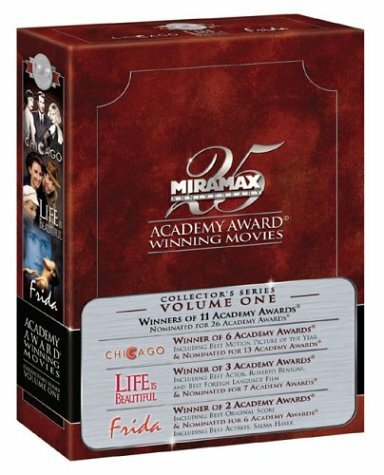 Catch the heat of the Academy Awards(R) with 3 Oscar(R)-winning films that have earned a combined 11 Academy Awards and 26 nominations, including 2003 Best Picture winner CHICAGO! CHICAGO: Starring Academy Award(R) winner Catherine Zeta-Jones (Best Supporting Actress), Golden Globe(R) winner Renée Zellweger (Best Actress), Golden Globe(R) winner Richard Gere (Best Actor), Queen Latifah, John C. Reilly, Lucy Liu, Taye Diggs, and Colm Feore. LIFE IS BEAUTIFUL: Starring internationally acclaimed director, co-writer, and Academy Award(R)-winning actor Roberto Benigni (Best Actor, 1998) and Nicoletta Braschi. FRIDA: Starring Salma Hayek, Alfred Molina, and Academy Award(R) winner Geoffrey Rush (1997 Best Actor, SHINE). Also starring Antonio Banderas, Ashley Judd, and Edward Norton. CLICK ON LINKS BELOW FOR INDIVIDUAL PRODUCT DETAILS.